Definition at line 78 of file CCopasiDataModel.h. Definition at line 80 of file CCopasiDataModel.h. Definition at line 113 of file CCopasiDataModel.cpp. References mRenameHandler, newModel(), CCopasiTimer::PROCESS, CCopasiObject::setRenameHandler(), and CCopasiTimer::WALL. Definition at line 127 of file CCopasiDataModel.cpp. Definition at line 144 of file CCopasiDataModel.cpp. References deleteOldData(), mData, mOldData, pdelete, pOldMetabolites, and CCopasiObject::setRenameHandler(). Definition at line 1727 of file CCopasiDataModel.cpp. References addReport(), C_INVALID_INDEX, CCopasiVectorN< CType >::getIndex(), CCopasiTask::getReport(), CReport::getReportDefinition(), mData, CCopasiDataModel::CData::pReportDefinitionList, pTask, CCopasiDataModel::CData::pTaskList, CReport::setReportDefinition(), and CCopasiTask::TypeName. Definition at line 1501 of file CCopasiDataModel.cpp. References addTask(), C_INVALID_INDEX, CCopasiVectorN< CType >::getIndex(), mData, CCopasiDataModel::CData::pTaskList, and CCopasiTask::TypeName. Definition at line 1544 of file CCopasiDataModel.cpp. References CCopasiVectorN< CType >::add(), CCopasiTask::fluxMode, CReportDefinition::getBodyAddr(), CReportDefinition::getFooterAddr(), CReportDefinition::getHeaderAddr(), CCopasiTask::lna, CCopasiTask::lyap, CCopasiTask::mca, mData, CCopasiTask::optimization, CCopasiTask::parameterFitting, CCopasiDataModel::CData::pReportDefinitionList, CCopasiTask::scan, CCopasiTask::sens, CReportDefinition::setComment(), CReportDefinition::setIsTable(), CReportDefinition::setSeparator(), CReportDefinition::setTaskType(), CReportDefinition::setTitle(), CCopasiTask::steadyState, CCopasiTask::timeCourse, CCopasiTask::tssAnalysis, and CCopasiTask::TypeName. Definition at line 1431 of file CCopasiDataModel.cpp. References CCopasiVectorN< CType >::add(), CCopasiTask::crosssection, CCopasiTask::fluxMode, CCopasiTask::getProblem(), CCopasiTask::lna, CCopasiTask::lyap, CCopasiTask::mca, mData, CCopasiTask::moieties, CCopasiTask::optimization, CCopasiTask::parameterFitting, CCopasiDataModel::CData::pModel, pTask, CCopasiDataModel::CData::pTaskList, CCopasiTask::scan, CCopasiTask::sens, CCopasiProblem::setModel(), CCopasiTask::steadyState, CCopasiTask::timeCourse, and CCopasiTask::tssAnalysis. Appends pointers to tasks, which are dependent on any of the candidates to the list dependentTasks. Definition at line 1512 of file CCopasiDataModel.cpp. 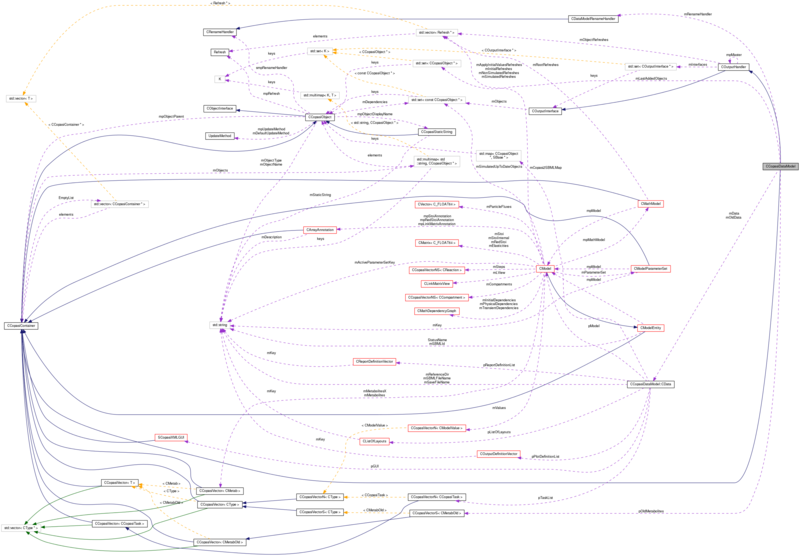 References CCopasiVector< T >::begin(), CCopasiVector< T >::end(), mData, and CCopasiDataModel::CData::pTaskList. Referenced by CQReportDefinition::btnDeleteReportClicked(), CQMessageBox::confirmDelete(), and CQReportDM::removeRows(). Definition at line 482 of file CCopasiDataModel.cpp. References CDirEntry::baseName(), COptions::getValue(), CCopasiDataModel::CData::mAutoSaveNeeded, mData, CCopasiDataModel::CData::mSaveFileName, saveModel(), and CDirEntry::Separator. Definition at line 1829 of file CCopasiDataModel.cpp. References CCopasiDataModel::CData::mAutoSaveNeeded, CCopasiDataModel::CData::mChanged, and mData. Referenced by commonAfterLoad(), CQTabWidget::save(), CQModelWidget::save(), CQSpeciesDetail::save(), CQNotes::save(), saveModel(), ScanWidget::saveTask(), SensitivitiesWidget::saveTask(), SteadyStateWidget::saveTask(), FunctionWidget1::saveToFunction(), and CQPlotSubwidget::saveToPlotSpec(). Definition at line 2069 of file CCopasiDataModel.cpp. References addDefaultReports(), addDefaultTasks(), CCopasiVector< T >::begin(), changed(), CModel::compileIfNecessary(), deleteOldData(), CCopasiVector< T >::end(), CCopasiMessage::getLastMessage(), CModel::getModelParameterSet(), mData, mOldData, CCopasiDataModel::CData::mWithGUI, CCopasiTask::NO_OUTPUT, CCopasiDataModel::CData::pCurrentSBMLDocument, CCopasiDataModel::CData::pGUI, CCopasiDataModel::CData::pListOfLayouts, CCopasiDataModel::CData::pModel, CCopasiDataModel::CData::pPlotDefinitionList, CCopasiDataModel::CData::pReportDefinitionList, CCopasiDataModel::CData::pTaskList, CModelEntity::setObjectParent(), CCopasiObject::setObjectParent(), CCopasiMessage::size(), CModel::updateInitialValues(), and CModelParameterSet::updateModel(). Referenced by importSBML(), importSBMLFromString(), loadModel(), and newModel(). Definition at line 1389 of file CCopasiDataModel.cpp. References mOldData, CCopasiDataModel::CData::pCurrentSBMLDocument, pdelete, CCopasiDataModel::CData::pGUI, CCopasiDataModel::CData::pListOfLayouts, CCopasiDataModel::CData::pModel, CCopasiDataModel::CData::pPlotDefinitionList, CCopasiDataModel::CData::pReportDefinitionList, and CCopasiDataModel::CData::pTaskList. Referenced by commonAfterLoad(), DataModelGUI::linkDataModelToGUI(), and ~CCopasiDataModel(). Definition at line 969 of file CCopasiDataModel.cpp. References CCopasiVector< T >::begin(), CCopasiMessage::clearDeque(), CModel::compileIfNecessary(), CDirEntry::dirName(), CCopasiVector< T >::end(), CCopasiMessage::ERROR, CDirEntry::exist(), CODEExporter::exportToStream(), CLocaleString::fromUtf8(), CModel::getModelValues(), CDirEntry::isWritable(), MCDirEntry, MCODEExporter, mData, CCopasiDataModel::CData::pModel, and CCopasiMessage::WARNING. Definition at line 917 of file CCopasiDataModel.cpp. References CCopasiVector< T >::begin(), CModel::compileIfNecessary(), CCopasiVector< T >::end(), CODEExporter::exportToStream(), CModel::getModelValues(), MCODEExporter, mData, CCopasiDataModel::CData::pModel, and CCopasiMessage::WARNING. Definition at line 798 of file CCopasiDataModel.cpp. References CCopasiMessage::clearDeque(), CModel::compileIfNecessary(), CSBMLExporter::disownSBMLDocument(), CCopasiMessage::ERROR, CCopasiMessage::EXCEPTION, CDirEntry::exist(), CSBMLExporter::exportModel(), CDirEntry::fileName(), CCopasiMessage::getAllMessageText(), CSBMLExporter::getCOPASI2SBMLMap(), CSBMLExporter::getSBMLDocument(), COptions::getValue(), CDirEntry::isRelativePath(), CDirEntry::isWritable(), CDirEntry::makePathAbsolute(), MCDirEntry, CCopasiDataModel::CData::mCopasi2SBMLMap, mData, CCopasiDataModel::CData::mSBMLFileName, CCopasiDataModel::CData::pCurrentSBMLDocument, pdelete, CCopasiDataModel::CData::pModel, and CSBMLExporter::setExportCOPASIMIRIAM(). Definition at line 709 of file CCopasiDataModel.cpp. References CCopasiMessage::clearDeque(), CModel::compileIfNecessary(), CSBMLExporter::disownSBMLDocument(), CCopasiMessage::EXCEPTION, CSBMLExporter::exportModelToString(), CCopasiMessage::getAllMessageText(), CSBMLExporter::getCOPASI2SBMLMap(), CSBMLExporter::getSBMLDocument(), CCopasiDataModel::CData::mCopasi2SBMLMap, mData, CCopasiDataModel::CData::pCurrentSBMLDocument, pdelete, CCopasiDataModel::CData::pModel, and CSBMLExporter::setExportCOPASIMIRIAM(). Referenced by test000054::test_bug1002(), test000055::test_bug1004(), test000057::test_bug1006(), test000058::test_bug1025_1(), test000058::test_bug1025_10(), test000058::test_bug1025_2(), test000058::test_bug1025_3(), test000058::test_bug1025_4(), test000058::test_bug1025_5(), test000058::test_bug1025_6(), test000058::test_bug1025_7(), test000058::test_bug1025_8(), test000058::test_bug1025_9(), test000076::test_bug1035_1(), test000076::test_bug1035_2(), test000076::test_bug1035_3(), test000067::test_bug1060(), test000068::test_bug1068(), test000069::test_bug1069(), test000070::test_bug1084(), test000071::test_bug1085(), test000072::test_bug1086(), test000074::test_bug1088(), test000081::test_bug1205(), test000089::test_bug1412(), test000093::test_bug1503_1(), test000093::test_bug1503_2(), test000100::test_bug1692_1(), test000100::test_bug1692_2(), test000101::test_bug1740(), test000102::test_bug1741(), test000103::test_bug1743_l2(), test000103::test_bug1743_l3(), test000050::test_bug894(), test000049::test_bug894(), test000048::test_bug919(), test000051::test_bug988(), test000060::test_bug_1026(), test000061::test_bug_1044(), test000091::test_delay_in_kinetic_law(), test000091::test_delay_in_kinetic_law_local_parameter(), test000082::test_export_delayAssignment_1(), test000082::test_export_delayAssignment_2(), test000082::test_export_delayAssignment_3(), test000082::test_export_delayAssignment_4(), test000082::test_export_delayAssignment_5(), test000082::test_export_delayAssignment_6(), test000077::test_export_dimensionless(), test000064::test_export_event_assignment_expression_and_hasOnlySubstanceUnits_1(), test000064::test_export_event_assignment_expression_and_hasOnlySubstanceUnits_2(), test000064::test_export_event_assignment_expression_and_hasOnlySubstanceUnits_3(), test000064::test_export_event_assignment_expression_and_hasOnlySubstanceUnits_4(), test000064::test_export_event_assignment_expression_and_hasOnlySubstanceUnits_5(), test000064::test_export_event_assignment_expression_and_hasOnlySubstanceUnits_6(), test000064::test_export_event_assignment_expression_and_hasOnlySubstanceUnits_7(), test000064::test_export_event_assignment_expression_and_hasOnlySubstanceUnits_8(), test000097::test_export_global_render_information(), test000097::test_export_local_render_information(), test000098::test_export_notes(), test000087::test_export_reaction_flux_reference_1(), test000087::test_export_reaction_flux_reference_2(), test000064::test_export_rule_expression_and_hasOnlySubstanceUnits_1(), test000064::test_export_rule_expression_and_hasOnlySubstanceUnits_2(), test000064::test_export_rule_expression_and_hasOnlySubstanceUnits_3(), test000064::test_export_rule_expression_and_hasOnlySubstanceUnits_4(), test000064::test_export_rule_expression_and_hasOnlySubstanceUnits_5(), test000064::test_export_rule_expression_and_hasOnlySubstanceUnits_6(), test000064::test_export_rule_expression_and_hasOnlySubstanceUnits_7(), test000064::test_export_rule_expression_and_hasOnlySubstanceUnits_8(), test000097::test_importexport_global_render_information(), test000097::test_importexport_local_render_information(), test000092::test_miriam_export_1(), test000092::test_miriam_export_2(), test000092::test_miriam_export_3(), test000092::test_miriam_export_4(), test000092::test_miriam_export_5(), test000092::test_miriam_export_6(), test000092::test_miriam_export_7(), test000092::test_miriam_export_8(), test000092::test_miriam_export_9(), test000097::test_readexport_global_render_information(), test000097::test_readexport_local_render_information(), test000059::test_unique_id_1(), test000059::test_unique_id_10(), test000059::test_unique_id_11(), test000059::test_unique_id_12(), test000059::test_unique_id_13(), test000059::test_unique_id_14(), test000059::test_unique_id_15(), test000059::test_unique_id_16(), test000059::test_unique_id_17(), test000059::test_unique_id_18(), test000059::test_unique_id_19(), test000059::test_unique_id_2(), test000059::test_unique_id_20(), test000059::test_unique_id_21(), test000059::test_unique_id_21_2(), test000059::test_unique_id_22(), test000059::test_unique_id_3(), test000059::test_unique_id_4(), test000059::test_unique_id_5(), test000059::test_unique_id_6(), test000059::test_unique_id_7(), test000059::test_unique_id_8(), test000059::test_unique_id_9(), Copasi2SBMLTranslator::translateFileToSBML(), and Copasi2SBMLTranslator::translateToSBML(). Definition at line 1854 of file CCopasiDataModel.cpp. Referenced by DataModelGUI::importCellDesigner(), SEDMLImporter::readListOfPlotsFromSedMLOutput(), and test000067::test_bug1060(). Definition at line 1835 of file CCopasiDataModel.cpp. Referenced by CSBMLExporter::createSBMLDocument(), DataModelGUI::importCellDesigner(), stress_test::normalizeMath(), test000054::test_bug1002(), test000055::test_bug1004(), test000056::test_bug1005(), test000057::test_bug1006(), test000058::test_bug1025_1(), test000058::test_bug1025_10(), test000058::test_bug1025_2(), test000058::test_bug1025_3(), test000058::test_bug1025_4(), test000058::test_bug1025_5(), test000058::test_bug1025_6(), test000058::test_bug1025_7(), test000058::test_bug1025_8(), test000058::test_bug1025_9(), test000076::test_bug1035_1(), test000076::test_bug1035_2(), test000076::test_bug1035_3(), test000067::test_bug1060(), test000068::test_bug1068(), test000069::test_bug1069(), test000071::test_bug1085(), test000081::test_bug1205(), test000089::test_bug1412(), test000093::test_bug1503_1(), test000093::test_bug1503_2(), test000049::test_bug894(), test000050::test_bug894(), test000048::test_bug919(), test000051::test_bug988(), test000060::test_bug_1026(), test000061::test_bug_1044(), test000091::test_delay_in_kinetic_law(), test000091::test_delay_in_kinetic_law_local_parameter(), test000082::test_export_delayAssignment_1(), test000082::test_export_delayAssignment_2(), test000082::test_export_delayAssignment_3(), test000082::test_export_delayAssignment_4(), test000082::test_export_delayAssignment_5(), test000082::test_export_delayAssignment_6(), test000077::test_export_dimensionless(), test000064::test_export_event_assignment_expression_and_hasOnlySubstanceUnits_1(), test000064::test_export_event_assignment_expression_and_hasOnlySubstanceUnits_2(), test000064::test_export_event_assignment_expression_and_hasOnlySubstanceUnits_3(), test000064::test_export_event_assignment_expression_and_hasOnlySubstanceUnits_4(), test000064::test_export_event_assignment_expression_and_hasOnlySubstanceUnits_5(), test000064::test_export_event_assignment_expression_and_hasOnlySubstanceUnits_6(), test000064::test_export_event_assignment_expression_and_hasOnlySubstanceUnits_7(), test000064::test_export_event_assignment_expression_and_hasOnlySubstanceUnits_8(), test000087::test_export_reaction_flux_reference_1(), test000087::test_export_reaction_flux_reference_2(), test000064::test_export_rule_expression_and_hasOnlySubstanceUnits_1(), test000064::test_export_rule_expression_and_hasOnlySubstanceUnits_2(), test000064::test_export_rule_expression_and_hasOnlySubstanceUnits_3(), test000064::test_export_rule_expression_and_hasOnlySubstanceUnits_4(), test000064::test_export_rule_expression_and_hasOnlySubstanceUnits_5(), test000064::test_export_rule_expression_and_hasOnlySubstanceUnits_6(), test000064::test_export_rule_expression_and_hasOnlySubstanceUnits_7(), test000064::test_export_rule_expression_and_hasOnlySubstanceUnits_8(), test000075::test_import_time_dependent_function_definition(), test000092::test_miriam_export_7(), test000094::test_notrequired_package(), test000059::test_unique_id_1(), test000059::test_unique_id_10(), test000059::test_unique_id_11(), test000059::test_unique_id_12(), test000059::test_unique_id_13(), test000059::test_unique_id_14(), test000059::test_unique_id_15(), test000059::test_unique_id_16(), test000059::test_unique_id_17(), test000059::test_unique_id_18(), test000059::test_unique_id_19(), test000059::test_unique_id_2(), test000059::test_unique_id_20(), test000059::test_unique_id_21(), test000059::test_unique_id_21_2(), test000059::test_unique_id_22(), test000059::test_unique_id_3(), test000059::test_unique_id_4(), test000059::test_unique_id_5(), test000059::test_unique_id_6(), test000059::test_unique_id_7(), test000059::test_unique_id_8(), and test000059::test_unique_id_9(). Definition at line 1947 of file CCopasiDataModel.cpp. Referenced by CQPlotSubwidget::addCurve2D(), CSEDMLExporter::createDataGenerators(), CScanItem::CScanItem(), CQOptimizationResult::enterProtected(), CQFittingResult::enterProtected(), CODEExporter::exportExpression(), CSBMLExporter::findModelEntityDependencies(), CArrayAnnotation::getAnnotationsString(), CExperimentObjectMap::CDataColumn::getDefaultScale(), CExpression::getNodeObject(), CSensItem::getSingleObjectDisplayName(), COptItem::getStartValue(), CSensItem::getVariablesPointerList(), CScanWidgetRandom::load(), CScanWidgetScan::load(), Curve2DWidget::LoadFromCurveSpec(), BandedGraphWidget::LoadFromCurveSpec(), HistoWidget::LoadFromCurveSpec(), CQFittingItemWidget::loadSelection(), CQExperimentData::loadTable(), SensitivitiesWidget::loadTask(), CQSimpleSelectionTree::populateTree(), CQReportListItem::refreshText(), COptItem::setObjectCN(), CQFittingItemWidget::setTableText(), CQExperimentData::slotTypeChanged(), and CEvaluationNodeObject::toAST(). Definition at line 1823 of file CCopasiDataModel.cpp. Referenced by main(), CReport::open(), CopasiUI3Window::slotExportMathModel(), and validate(). Definition at line 1815 of file CCopasiDataModel.cpp. References CCopasiDataModel::CData::isValid(), mData, mOldData, and CCopasiDataModel::CData::pGUI. Referenced by SliderDialog::getCSlidersForObject(), and save_cps_model_to_stream(). Definition at line 1807 of file CCopasiDataModel.cpp. References CCopasiDataModel::CData::isValid(), mData, mOldData, and CCopasiDataModel::CData::pListOfLayouts. Referenced by CQNewMainWindow::addGlobalRenderInfoItemsToList(), test000097::addGlobalRenderInformation(), test000097::addLocalRenderInformation(), test000097::createModel(), CSBMLExporter::exportModelToString(), Arguments::handleCommandLine(), DataModelGUI::importCellDesigner(), CQLayoutScene::initializeResolver(), save_cps_model_to_stream(), CQLayoutsWidget::slotBtnNewClicked(), CQLayoutView::slotLayoutChanged(), CQNewMainWindow::slotLayoutChanged(), CQNewMainWindow::slotRenderInfoChanged(), CQLayoutView::slotRenderInformationChanged(), test000097::test_import_global_render_information(), test000097::test_import_local_render_information(), test000097::test_importexport_global_render_information(), test000097::test_importexport_local_render_information(), test000097::test_importwrite_global_render_information(), test000097::test_importwrite_local_render_information(), test000097::test_read_global_render_information(), test000097::test_read_local_render_information(), test000097::test_readexport_global_render_information(), test000097::test_readexport_local_render_information(), test000097::test_readwrite_global_render_information(), test000097::test_readwrite_local_render_information(), CQGLLayoutPainter::update(), updateLayoutList(), CQNewMainWindow::updateLayoutList(), updateRenderInformationList(), and CQNewMainWindow::updateRenderInformationList(). Definition at line 1799 of file CCopasiDataModel.cpp. Definition at line 1407 of file CCopasiDataModel.cpp. References CCopasiDataModel::CData::isValid(), mData, mOldData, and CCopasiDataModel::CData::pModel. Referenced by CQPlotSubwidget::addCurve2D(), CCopasiXML::buildFunctionList(), CExperiment::calculateStatistics(), CSBMLExporter::check_for_spatial_size_units(), CSBMLExporter::checkForEvents(), CSBMLExporter::checkForInitialAssignments(), CSBMLExporter::checkForODESpeciesInNonfixedCompartment(), CSBMLExporter::checkForPiecewiseFunctions(), CSBMLExporter::checkForUnsupportedObjectReferences(), CSBMLExporter::collectIds(), CTimeSeries::compile(), COutputHandler::compileRefresh(), CQMessageBox::confirmDelete(), CQSpeciesDetail::copy(), CQCompartment::copy(), ReactionsWidget1::copy(), CSBMLExporter::createAreaUnit(), CSBMLExporter::createCompartments(), CSEDMLExporter::createDataGenerators(), CSBMLExporter::createEvents(), CSBMLExporter::createLengthUnit(), CSBMLExporter::createMetabolites(), test000097::createModel(), CSBMLExporter::createParameters(), createParameterSetsForExperiment(), CSBMLExporter::createReactions(), CSBMLExporter::createSBMLDocument(), CSEDMLExporter::createSEDMLDocument(), CSBMLExporter::createSubstanceUnit(), CSBMLExporter::createTimeUnit(), CSBMLExporter::createVolumeUnit(), CQPlotSubwidget::deletePlot(), CQNewMainWindow::elementaryModeTriggeredSlot(), CQLayoutsWidget::enterProtected(), CODEExporter::exportExpression(), CODEExporter::exportObjectNodesFromModel(), CODEExporter::exportToStream(), CSBMLExporter::findAvogadro(), findObjectByDisplayName(), SliderDialog::getCSlidersForObject(), getQuantityParameterOrValue(), QConservedSpeciesAnimation::getScales(), CSensItem::getVariablesPointerList(), SEDMLUtils::getXPathForObject(), CSBMLExporter::hasVolumeAssignment(), QConservedSpeciesAnimation::initialize(), QFluxModeAnimation::initialize(), QTimeCourseAnimation::initialize(), CTSSAMethod::initializeIntegrationsParameter(), CLsodaMethod::initializeParameter(), CScanTask::initSubtask(), CQSpecieDM::insertRows(), CSBMLExporter::isModelSBMLCompatible(), CSlider::isValid(), CQMoietiesTaskResult::load(), CSteadyStateProblem::load(), CQBrowserPaneDM::load(), CTrajectoryProblem::load(), FunctionWidget1::loadParameterTable(), main(), stress_test::normalizeAndSimplifyExpressions(), CQPlotDM::removeRows(), CQReactionDM::removeRows(), CQFunctionDM::removeRows(), CQEventDM::removeRows(), CQGlobalQuantityDM::removeRows(), CQCompartmentDM::removeRows(), CQSpecieDM::removeRows(), CSBMLExporter::replace_local_parameters(), CSBMLExporter::replaceSpeciesReferences(), CSBMLExporter::restore_local_parameters(), CQFittingWidget::runTask(), save_cps_model_to_stream(), ReactionsWidget1::saveToReaction(), CQReactionDM::setEquation(), CSlider::setSliderObject(), CQCrossSectionTaskWidget::showUnits(), CQTrajectoryWidget::showUnits(), CQPlotsWidget::slotBtnActivateAllClicked(), CQPlotsWidget::slotBtnDeactivateAllClicked(), ReactionsWidget1::slotBtnDelete(), CQCompartment::slotBtnDelete(), CQModelValue::slotBtnDelete(), CQEventWidget1::slotBtnDelete(), ReactionsWidget1::slotBtnNew(), CQSpeciesDetail::slotBtnNew(), CQLayoutsWidget::slotBtnNewClicked(), CQPlotsWidget::slotDoubleClicked(), CQReactionsWidget::slotDoubleClicked(), CQReportsWidget::slotDoubleClicked(), CQCompartmentsWidget::slotDoubleClicked(), CQEventsWidget::slotDoubleClicked(), CQGlobalQuantitiesWidget::slotDoubleClicked(), CQSpeciesWidget::slotDoubleClicked(), CQFittingWidget::taskFinishedEvent(), test000053::test1_bug1000(), test000053::test2_bug1000(), test000053::test3_bug1000(), test000053::test4_bug1000(), test000053::test5_bug1000(), test000054::test_bug1002(), test000055::test_bug1004(), test000057::test_bug1006(), test000058::test_bug1025_1(), test000058::test_bug1025_10(), test000058::test_bug1025_2(), test000058::test_bug1025_3(), test000058::test_bug1025_4(), test000058::test_bug1025_5(), test000058::test_bug1025_6(), test000058::test_bug1025_7(), test000058::test_bug1025_8(), test000058::test_bug1025_9(), test000076::test_bug1035_1(), test000076::test_bug1035_2(), test000076::test_bug1035_3(), test000067::test_bug1060(), test000068::test_bug1068(), test000069::test_bug1069(), test000071::test_bug1085(), test000073::test_bug1087(), test000081::test_bug1205(), test000089::test_bug1412(), test000093::test_bug1503_1(), test000093::test_bug1503_2(), test000099::test_bug1675(), test000103::test_bug1743_l2(), test000103::test_bug1743_l3(), test000049::test_bug894(), test000050::test_bug894(), test000048::test_bug919(), test000051::test_bug988(), test000052::test_bug988(), test000060::test_bug_1026(), test000061::test_bug_1044(), test000047::test_delay(), test000091::test_delay_in_kinetic_law(), test000091::test_delay_in_kinetic_law_local_parameter(), test000063::test_events_1(), test000082::test_export_delayAssignment_1(), test000082::test_export_delayAssignment_2(), test000082::test_export_delayAssignment_3(), test000082::test_export_delayAssignment_4(), test000082::test_export_delayAssignment_5(), test000082::test_export_delayAssignment_6(), test000077::test_export_dimensionless(), test000064::test_export_event_assignment_expression_and_hasOnlySubstanceUnits_1(), test000064::test_export_event_assignment_expression_and_hasOnlySubstanceUnits_2(), test000064::test_export_event_assignment_expression_and_hasOnlySubstanceUnits_3(), test000064::test_export_event_assignment_expression_and_hasOnlySubstanceUnits_4(), test000064::test_export_event_assignment_expression_and_hasOnlySubstanceUnits_5(), test000064::test_export_event_assignment_expression_and_hasOnlySubstanceUnits_6(), test000064::test_export_event_assignment_expression_and_hasOnlySubstanceUnits_7(), test000064::test_export_event_assignment_expression_and_hasOnlySubstanceUnits_8(), test000087::test_export_reaction_flux_reference_1(), test000087::test_export_reaction_flux_reference_2(), test000064::test_export_rule_expression_and_hasOnlySubstanceUnits_1(), test000064::test_export_rule_expression_and_hasOnlySubstanceUnits_2(), test000064::test_export_rule_expression_and_hasOnlySubstanceUnits_3(), test000064::test_export_rule_expression_and_hasOnlySubstanceUnits_4(), test000064::test_export_rule_expression_and_hasOnlySubstanceUnits_5(), test000064::test_export_rule_expression_and_hasOnlySubstanceUnits_6(), test000064::test_export_rule_expression_and_hasOnlySubstanceUnits_7(), test000064::test_export_rule_expression_and_hasOnlySubstanceUnits_8(), test000021::test_hasOnlySubstanceUnits(), test000022::test_hasOnlySubstanceUnits(), test000023::test_hasOnlySubstanceUnits(), test000024::test_hasOnlySubstanceUnits(), test000025::test_hasOnlySubstanceUnits(), test000026::test_hasOnlySubstanceUnits(), test000027::test_hasOnlySubstanceUnits(), test000028::test_hasOnlySubstanceUnits(), test000029::test_hasOnlySubstanceUnits(), test000030::test_hasOnlySubstanceUnits(), test000031::test_hasOnlySubstanceUnits(), test000032::test_hasOnlySubstanceUnits(), test000033::test_hasOnlySubstanceUnits(), test000034::test_hasOnlySubstanceUnits(), test000035::test_hasOnlySubstanceUnits(), test000036::test_hasOnlySubstanceUnits(), test000037::test_hasOnlySubstanceUnits(), test000038::test_hasOnlySubstanceUnits(), test000039::test_hasOnlySubstanceUnits(), test000040::test_hasOnlySubstanceUnits(), test000041::test_hasOnlySubstanceUnits(), test000042::test_hasOnlySubstanceUnits(), test000043::test_hasOnlySubstanceUnits(), test000088::test_import_assignment_without_expression(), test000086::test_import_compartment_units_1(), test000084::test_import_compartment_units_1(), test000083::test_import_compartment_units_1(), test000085::test_import_compartment_units_1(), test000086::test_import_compartment_units_10(), test000083::test_import_compartment_units_10(), test000084::test_import_compartment_units_10(), test000085::test_import_compartment_units_10(), test000086::test_import_compartment_units_11(), test000083::test_import_compartment_units_11(), test000084::test_import_compartment_units_11(), test000085::test_import_compartment_units_11(), test000083::test_import_compartment_units_12(), test000085::test_import_compartment_units_12(), test000084::test_import_compartment_units_12(), test000083::test_import_compartment_units_13(), test000085::test_import_compartment_units_13(), test000084::test_import_compartment_units_13(), test000083::test_import_compartment_units_14(), test000085::test_import_compartment_units_14(), test000084::test_import_compartment_units_14(), test000084::test_import_compartment_units_15(), test000085::test_import_compartment_units_15(), test000083::test_import_compartment_units_15(), test000083::test_import_compartment_units_16(), test000085::test_import_compartment_units_16(), test000084::test_import_compartment_units_16(), test000083::test_import_compartment_units_17(), test000084::test_import_compartment_units_17(), test000085::test_import_compartment_units_17(), test000083::test_import_compartment_units_18(), test000085::test_import_compartment_units_18(), test000084::test_import_compartment_units_18(), test000084::test_import_compartment_units_19(), test000085::test_import_compartment_units_19(), test000083::test_import_compartment_units_19(), test000086::test_import_compartment_units_2(), test000084::test_import_compartment_units_2(), test000085::test_import_compartment_units_2(), test000083::test_import_compartment_units_2(), test000083::test_import_compartment_units_20(), test000084::test_import_compartment_units_20(), test000085::test_import_compartment_units_20(), test000083::test_import_compartment_units_21(), test000084::test_import_compartment_units_21(), test000085::test_import_compartment_units_21(), test000086::test_import_compartment_units_3(), test000083::test_import_compartment_units_3(), test000085::test_import_compartment_units_3(), test000084::test_import_compartment_units_3(), test000086::test_import_compartment_units_4(), test000085::test_import_compartment_units_4(), test000084::test_import_compartment_units_4(), test000083::test_import_compartment_units_4(), test000086::test_import_compartment_units_5(), test000085::test_import_compartment_units_5(), test000084::test_import_compartment_units_5(), test000083::test_import_compartment_units_5(), test000086::test_import_compartment_units_6(), test000085::test_import_compartment_units_6(), test000084::test_import_compartment_units_6(), test000083::test_import_compartment_units_6(), test000086::test_import_compartment_units_7(), test000084::test_import_compartment_units_7(), test000083::test_import_compartment_units_7(), test000085::test_import_compartment_units_7(), test000086::test_import_compartment_units_8(), test000084::test_import_compartment_units_8(), test000085::test_import_compartment_units_8(), test000083::test_import_compartment_units_8(), test000086::test_import_compartment_units_9(), test000084::test_import_compartment_units_9(), test000083::test_import_compartment_units_9(), test000085::test_import_compartment_units_9(), test000082::test_import_delayAssignment_1(), test000082::test_import_delayAssignment_2(), test000082::test_import_delayAssignment_3(), test000082::test_import_delayAssignment_4(), test000082::test_import_delayAssignment_5(), test000082::test_import_delayAssignment_6(), test000082::test_import_delayAssignment_7(), test000082::test_import_delayAssignment_8(), test000077::test_import_dimensionless_1(), test000077::test_import_dimensionless_2(), test000064::test_import_event_assignment_expression_and_hasOnlySubstanceUnits_1(), test000064::test_import_event_assignment_expression_and_hasOnlySubstanceUnits_2(), test000064::test_import_event_assignment_expression_and_hasOnlySubstanceUnits_3(), test000064::test_import_event_assignment_expression_and_hasOnlySubstanceUnits_4(), test000064::test_import_event_assignment_expression_and_hasOnlySubstanceUnits_5(), test000064::test_import_event_assignment_expression_and_hasOnlySubstanceUnits_6(), test000064::test_import_event_assignment_expression_and_hasOnlySubstanceUnits_7(), test000064::test_import_event_assignment_expression_and_hasOnlySubstanceUnits_8(), test000088::test_import_eventassignment_without_expression(), test000079::test_import_fast(), test000088::test_import_initialassignment_without_expression(), test000095::test_import_l3_event_1(), test000095::test_import_l3_event_2(), test000095::test_import_l3_event_3(), test000095::test_import_l3_event_4(), test000095::test_import_l3_event_5(), test000098::test_import_notes(), test000087::test_import_reaction_flux_reference_2(), test000066::test_import_reaction_with_constant_flux(), test000066::test_import_reaction_with_constant_flux_function(), test000066::test_import_reaction_with_constant_flux_function_global_parameter(), test000066::test_import_reaction_with_constant_flux_global_parameter(), test000066::test_import_reaction_with_constant_flux_reversible(), test000066::test_import_reaction_with_constant_flux_reversible_function(), test000066::test_import_reaction_with_constant_flux_reversible_function_global_parameter(), test000066::test_import_reaction_with_constant_flux_reversible_global_parameter(), test000065::test_import_reaction_with_unsuitable_kinetic_1(), test000065::test_import_reaction_with_unsuitable_kinetic_2(), test000064::test_import_rule_expression_and_hasOnlySubstanceUnits_1(), test000064::test_import_rule_expression_and_hasOnlySubstanceUnits_2(), test000064::test_import_rule_expression_and_hasOnlySubstanceUnits_3(), test000064::test_import_rule_expression_and_hasOnlySubstanceUnits_4(), test000064::test_import_rule_expression_and_hasOnlySubstanceUnits_5(), test000064::test_import_rule_expression_and_hasOnlySubstanceUnits_6(), test000064::test_import_rule_expression_and_hasOnlySubstanceUnits_7(), test000064::test_import_rule_expression_and_hasOnlySubstanceUnits_8(), test000075::test_import_time_dependent_function_definition(), test000062::test_kineticlaw_without_math(), test000078::test_l2v4_import_unordered_functions(), test000080::test_mass_action_recognition_bug(), test000092::test_miriam_export_1(), test000092::test_miriam_export_2(), test000092::test_miriam_export_3(), test000092::test_miriam_export_4(), test000092::test_miriam_export_5(), test000092::test_miriam_export_6(), test000092::test_miriam_export_7(), test000092::test_miriam_export_8(), test000092::test_miriam_export_9(), test000092::test_miriam_import_1(), test000094::test_notrequired_package(), test000087::test_simulate_reaction_flux_reference_1(), test000045::test_stoichiometricExpression(), test000046::test_stoichiometricExpression(), test000044::test_stoichiometricExpression(), test000059::test_unique_id_1(), test000059::test_unique_id_10(), test000059::test_unique_id_11(), test000059::test_unique_id_12(), test000059::test_unique_id_13(), test000059::test_unique_id_14(), test000059::test_unique_id_15(), test000059::test_unique_id_16(), test000059::test_unique_id_17(), test000059::test_unique_id_18(), test000059::test_unique_id_19(), test000059::test_unique_id_2(), test000059::test_unique_id_20(), test000059::test_unique_id_21(), test000059::test_unique_id_21_2(), test000059::test_unique_id_22(), test000059::test_unique_id_3(), test000059::test_unique_id_4(), test000059::test_unique_id_5(), test000059::test_unique_id_6(), test000059::test_unique_id_7(), test000059::test_unique_id_8(), test000059::test_unique_id_9(), CQGLLayoutPainter::update(), and validate(). Definition at line 1404 of file CCopasiDataModel.cpp. Definition at line 1783 of file CCopasiDataModel.cpp. References CCopasiDataModel::CData::isValid(), mData, mOldData, and CCopasiDataModel::CData::pPlotDefinitionList. Referenced by CQPlotSubwidget::addPlot(), CQPlotSubwidget::copyPlot(), CSEDMLExporter::createDataGenerators(), COutputAssistant::createDefaultOutput(), COutputAssistant::createPlot(), CSEDMLExporter::createSEDMLDocument(), CQPlotSubwidget::deletePlot(), CQBrowserPaneDM::load(), Arguments::prepareModel(), CQPlotDM::removeRows(), save_cps_model_to_stream(), CQPlotsWidget::slotBtnActivateAllClicked(), CQPlotsWidget::slotBtnDeactivateAllClicked(), and CQPlotsWidget::slotDoubleClicked(). Definition at line 1791 of file CCopasiDataModel.cpp. Definition at line 1952 of file CCopasiDataModel.cpp. Referenced by CQNewMainWindow::CQNewMainWindow(), and SBMLImporter::parseSBML(). Definition at line 1767 of file CCopasiDataModel.cpp. References CCopasiDataModel::CData::isValid(), mData, mOldData, and CCopasiDataModel::CData::pReportDefinitionList. Referenced by CQReportDefinition::btnCopyReportClicked(), CQReportDefinition::btnDeleteReportClicked(), COutputAssistant::createTable(), SEDMLImporter::importTasks(), CQBrowserPaneDM::load(), SEDMLImporter::readListOfPlotsFromSedMLOutput(), CQReportDM::removeRows(), save_cps_model_to_stream(), CQReportsWidget::slotDoubleClicked(), and test000087::test_simulate_reaction_flux_reference_1(). Definition at line 1775 of file CCopasiDataModel.cpp. Definition at line 1851 of file CCopasiDataModel.cpp. Definition at line 1415 of file CCopasiDataModel.cpp. References CCopasiDataModel::CData::isValid(), mData, mOldData, and CCopasiDataModel::CData::pTaskList. Referenced by CQNewMainWindow::checkForElementaryModesSlot(), COutputAssistant::createDefaultOutput(), CSEDMLExporter::createScanTask(), CSEDMLExporter::createSteadyStateTask(), CSEDMLExporter::createTasks(), CSEDMLExporter::createTimeCourseTask(), CQNewMainWindow::elementaryModeTriggeredSlot(), CFitProblem::elevateChildren(), CQFittingResult::enterProtected(), QFluxModeAnimation::getScales(), QTimeCourseAnimation::getScales(), CMCAProblem::getSubTask(), SEDMLImporter::importTasks(), CFitProblem::initialize(), QFluxModeAnimation::initialize(), CSensMethod::initialize(), CNewtonMethod::initialize(), QTimeCourseAnimation::initialize(), CScanTask::initSubtask(), CQBrowserPaneDM::load(), main(), CQSimpleSelectionTree::populateTree(), Arguments::prepareModel(), save_cps_model_to_stream(), CLNAProblem::setSteadyStateRequested(), CMCAProblem::setSteadyStateRequested(), test000087::test_simulate_reaction_flux_reference_1(), SEDMLImporter::updateCopasiTaskForSimulation(), and validate(). Definition at line 1423 of file CCopasiDataModel.cpp. Definition at line 603 of file CCopasiDataModel.cpp. References CCopasiContainer::add(), CDirEntry::baseName(), CCopasiMessage::clearDeque(), commonAfterLoad(), SBMLImporter::deleteCopasiModel(), CDirEntry::dirName(), CDirEntry::fileName(), CLocaleString::fromUtf8(), CCopasiRootContainer::getFunctionList(), CCopasiTask::getProblem(), COptions::getValue(), CDirEntry::isRelativePath(), CDirEntry::makePathAbsolute(), CCopasiDataModel::CData::mCopasi2SBMLMap, mData, CCopasiDataModel::CData::mFileType, CCopasiDataModel::CData::mReferenceDir, mRenameHandler, CCopasiDataModel::CData::mSaveFileName, CCopasiDataModel::CData::mSBMLFileName, CDirEntry::normalize(), CCopasiDataModel::CData::pCurrentSBMLDocument, CCopasiDataModel::CData::pListOfLayouts, CCopasiDataModel::CData::pModel, popData(), CCopasiDataModel::CData::pTaskList, pushData(), SBMLImporter::readSBML(), SBMLImporter::restoreFunctionDB(), SBML, CDirEntry::Separator, CDataModelRenameHandler::setEnabled(), SBMLImporter::setImportCOPASIMIRIAM(), SBMLImporter::setImportHandler(), and CDirEntry::suffix(). Referenced by Arguments::handleCommandLine(), main(), and stress_test::normalizeMath(). Definition at line 526 of file CCopasiDataModel.cpp. 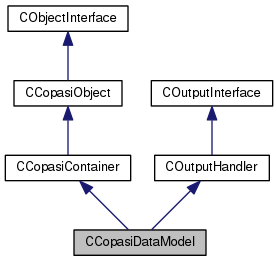 References CCopasiContainer::add(), CCopasiMessage::clearDeque(), commonAfterLoad(), SBMLImporter::deleteCopasiModel(), CCopasiRootContainer::getFunctionList(), CCopasiTask::getProblem(), CCopasiDataModel::CData::mCopasi2SBMLMap, mData, CCopasiDataModel::CData::mFileType, mRenameHandler, SBMLImporter::parseSBML(), CCopasiDataModel::CData::pCurrentSBMLDocument, CCopasiDataModel::CData::pListOfLayouts, CCopasiDataModel::CData::pModel, popData(), CCopasiDataModel::CData::pTaskList, pushData(), SBMLImporter::restoreFunctionDB(), SBML, CDataModelRenameHandler::setEnabled(), SBMLImporter::setImportCOPASIMIRIAM(), and SBMLImporter::setImportHandler(). Referenced by test000053::test1_bug1000(), test000053::test2_bug1000(), test000053::test3_bug1000(), test000053::test4_bug1000(), test000053::test5_bug1000(), test000055::test_bug1004(), test000056::test_bug1005(), test000057::test_bug1006(), test000058::test_bug1025_1(), test000058::test_bug1025_2(), test000058::test_bug1025_3(), test000058::test_bug1025_4(), test000058::test_bug1025_5(), test000068::test_bug1068(), test000070::test_bug1084(), test000071::test_bug1085(), test000072::test_bug1086(), test000073::test_bug1087(), test000074::test_bug1088(), test000093::test_bug1503_1(), test000093::test_bug1503_2(), test000099::test_bug1675(), test000101::test_bug1740(), test000102::test_bug1741(), test000103::test_bug1743_l2(), test000103::test_bug1743_l3(), test000104::test_bug1744(), test000052::test_bug988(), test000060::test_bug_1026(), test000047::test_delay(), test000090::test_delay_in_function(), test000091::test_delay_in_kinetic_law(), test000091::test_delay_in_kinetic_law_local_parameter(), test000063::test_events_1(), test000032::test_hasOnlySubstanceUnits(), test000027::test_hasOnlySubstanceUnits(), test000035::test_hasOnlySubstanceUnits(), test000036::test_hasOnlySubstanceUnits(), test000023::test_hasOnlySubstanceUnits(), test000037::test_hasOnlySubstanceUnits(), test000028::test_hasOnlySubstanceUnits(), test000038::test_hasOnlySubstanceUnits(), test000024::test_hasOnlySubstanceUnits(), test000039::test_hasOnlySubstanceUnits(), test000029::test_hasOnlySubstanceUnits(), test000040::test_hasOnlySubstanceUnits(), test000030::test_hasOnlySubstanceUnits(), test000041::test_hasOnlySubstanceUnits(), test000042::test_hasOnlySubstanceUnits(), test000025::test_hasOnlySubstanceUnits(), test000031::test_hasOnlySubstanceUnits(), test000043::test_hasOnlySubstanceUnits(), test000033::test_hasOnlySubstanceUnits(), test000022::test_hasOnlySubstanceUnits(), test000026::test_hasOnlySubstanceUnits(), test000034::test_hasOnlySubstanceUnits(), test000021::test_hasOnlySubstanceUnits(), test000088::test_import_assignment_without_expression(), test000086::test_import_compartment_units_1(), test000084::test_import_compartment_units_1(), test000085::test_import_compartment_units_1(), test000083::test_import_compartment_units_1(), test000086::test_import_compartment_units_10(), test000084::test_import_compartment_units_10(), test000085::test_import_compartment_units_10(), test000083::test_import_compartment_units_10(), test000086::test_import_compartment_units_11(), test000084::test_import_compartment_units_11(), test000085::test_import_compartment_units_11(), test000083::test_import_compartment_units_11(), test000084::test_import_compartment_units_12(), test000085::test_import_compartment_units_12(), test000083::test_import_compartment_units_12(), test000084::test_import_compartment_units_13(), test000085::test_import_compartment_units_13(), test000083::test_import_compartment_units_13(), test000084::test_import_compartment_units_14(), test000085::test_import_compartment_units_14(), test000083::test_import_compartment_units_14(), test000084::test_import_compartment_units_15(), test000085::test_import_compartment_units_15(), test000083::test_import_compartment_units_15(), test000085::test_import_compartment_units_16(), test000084::test_import_compartment_units_16(), test000083::test_import_compartment_units_16(), test000084::test_import_compartment_units_17(), test000085::test_import_compartment_units_17(), test000083::test_import_compartment_units_17(), test000084::test_import_compartment_units_18(), test000085::test_import_compartment_units_18(), test000083::test_import_compartment_units_18(), test000083::test_import_compartment_units_19(), test000084::test_import_compartment_units_19(), test000085::test_import_compartment_units_19(), test000086::test_import_compartment_units_2(), test000084::test_import_compartment_units_2(), test000085::test_import_compartment_units_2(), test000083::test_import_compartment_units_2(), test000083::test_import_compartment_units_20(), test000084::test_import_compartment_units_20(), test000085::test_import_compartment_units_20(), test000083::test_import_compartment_units_21(), test000085::test_import_compartment_units_21(), test000084::test_import_compartment_units_21(), test000086::test_import_compartment_units_3(), test000084::test_import_compartment_units_3(), test000085::test_import_compartment_units_3(), test000083::test_import_compartment_units_3(), test000086::test_import_compartment_units_4(), test000084::test_import_compartment_units_4(), test000085::test_import_compartment_units_4(), test000083::test_import_compartment_units_4(), test000086::test_import_compartment_units_5(), test000084::test_import_compartment_units_5(), test000085::test_import_compartment_units_5(), test000083::test_import_compartment_units_5(), test000086::test_import_compartment_units_6(), test000084::test_import_compartment_units_6(), test000083::test_import_compartment_units_6(), test000085::test_import_compartment_units_6(), test000086::test_import_compartment_units_7(), test000084::test_import_compartment_units_7(), test000085::test_import_compartment_units_7(), test000083::test_import_compartment_units_7(), test000086::test_import_compartment_units_8(), test000084::test_import_compartment_units_8(), test000085::test_import_compartment_units_8(), test000083::test_import_compartment_units_8(), test000086::test_import_compartment_units_9(), test000085::test_import_compartment_units_9(), test000084::test_import_compartment_units_9(), test000083::test_import_compartment_units_9(), test000082::test_import_delayAssignment_1(), test000082::test_import_delayAssignment_2(), test000082::test_import_delayAssignment_3(), test000082::test_import_delayAssignment_4(), test000082::test_import_delayAssignment_5(), test000082::test_import_delayAssignment_6(), test000082::test_import_delayAssignment_7(), test000082::test_import_delayAssignment_8(), test000077::test_import_dimensionless_1(), test000077::test_import_dimensionless_2(), test000077::test_import_dimensionless_3(), test000077::test_import_dimensionless_4(), test000077::test_import_dimensionless_5(), test000064::test_import_event_assignment_expression_and_hasOnlySubstanceUnits_1(), test000064::test_import_event_assignment_expression_and_hasOnlySubstanceUnits_2(), test000064::test_import_event_assignment_expression_and_hasOnlySubstanceUnits_3(), test000064::test_import_event_assignment_expression_and_hasOnlySubstanceUnits_4(), test000064::test_import_event_assignment_expression_and_hasOnlySubstanceUnits_5(), test000064::test_import_event_assignment_expression_and_hasOnlySubstanceUnits_6(), test000064::test_import_event_assignment_expression_and_hasOnlySubstanceUnits_7(), test000064::test_import_event_assignment_expression_and_hasOnlySubstanceUnits_8(), test000088::test_import_eventassignment_without_expression(), test000079::test_import_fast(), test000097::test_import_global_render_information(), test000088::test_import_initialassignment_without_expression(), test000095::test_import_l3_event_1(), test000095::test_import_l3_event_2(), test000095::test_import_l3_event_3(), test000095::test_import_l3_event_4(), test000095::test_import_l3_event_5(), test000097::test_import_local_render_information(), test000098::test_import_notes(), test000087::test_import_reaction_flux_reference_1(), test000087::test_import_reaction_flux_reference_2(), test000087::test_import_reaction_flux_reference_3(), test000066::test_import_reaction_with_constant_flux(), test000066::test_import_reaction_with_constant_flux_function(), test000066::test_import_reaction_with_constant_flux_function_global_parameter(), test000066::test_import_reaction_with_constant_flux_global_parameter(), test000066::test_import_reaction_with_constant_flux_reversible(), test000066::test_import_reaction_with_constant_flux_reversible_function(), test000066::test_import_reaction_with_constant_flux_reversible_function_global_parameter(), test000066::test_import_reaction_with_constant_flux_reversible_global_parameter(), test000065::test_import_reaction_with_unsuitable_kinetic_1(), test000065::test_import_reaction_with_unsuitable_kinetic_2(), test000064::test_import_rule_expression_and_hasOnlySubstanceUnits_1(), test000064::test_import_rule_expression_and_hasOnlySubstanceUnits_2(), test000064::test_import_rule_expression_and_hasOnlySubstanceUnits_3(), test000064::test_import_rule_expression_and_hasOnlySubstanceUnits_4(), test000064::test_import_rule_expression_and_hasOnlySubstanceUnits_5(), test000064::test_import_rule_expression_and_hasOnlySubstanceUnits_6(), test000064::test_import_rule_expression_and_hasOnlySubstanceUnits_7(), test000064::test_import_rule_expression_and_hasOnlySubstanceUnits_8(), test000075::test_import_time_dependent_function_definition(), test000097::test_importexport_global_render_information(), test000097::test_importexport_local_render_information(), test000097::test_importwrite_global_render_information(), test000097::test_importwrite_local_render_information(), test000062::test_kineticlaw_without_math(), test000078::test_l2v4_import_unordered_functions(), test000080::test_mass_action_recognition_bug(), test000092::test_miriam_export_1(), test000092::test_miriam_export_2(), test000092::test_miriam_export_3(), test000092::test_miriam_export_4(), test000092::test_miriam_export_5(), test000092::test_miriam_export_6(), test000092::test_miriam_export_7(), test000092::test_miriam_export_8(), test000092::test_miriam_export_9(), test000092::test_miriam_import_1(), test000094::test_notrequired_package(), test000094::test_required_package(), test000087::test_simulate_reaction_flux_reference_1(), test000044::test_stoichiometricExpression(), test000046::test_stoichiometricExpression(), test000045::test_stoichiometricExpression(), test000059::test_unique_id_1(), test000059::test_unique_id_10(), test000059::test_unique_id_17(), test000059::test_unique_id_18(), test000059::test_unique_id_19(), test000059::test_unique_id_2(), test000059::test_unique_id_20(), test000059::test_unique_id_22(), test000059::test_unique_id_3(), test000059::test_unique_id_4(), test000059::test_unique_id_5(), test000059::test_unique_id_6(), test000059::test_unique_id_7(), test000059::test_unique_id_8(), test000059::test_unique_id_9(), and Copasi2SBMLTranslator::translate(). Definition at line 1826 of file CCopasiDataModel.cpp. Definition at line 158 of file CCopasiDataModel.cpp. References CCopasiContainer::add(), CCopasiMessage::clearDeque(), commonAfterLoad(), CopasiML, CCopasiMessage::ERROR, CCopasiXML::freeGUI(), CCopasiXML::freeLayoutList(), CCopasiXML::freeModel(), CCopasiXML::freePlotList(), CCopasiXML::freeReportList(), CCopasiXML::freeTaskList(), Gepasi, CCopasiRootContainer::getFunctionList(), CCopasiXML::getLayoutList(), CCopasiXML::getModel(), CCopasiXML::getPlotList(), CCopasiXML::getReportList(), CCopasiXML::getTaskList(), CReadConfig::getVersion(), CCopasiXML::load(), CModel::load(), CTrajectoryTask::load(), CSteadyStateTask::load(), MCXML, mData, CCopasiDataModel::CData::mFileType, mRenameHandler, CCopasiDataModel::CData::mWithGUI, newModel(), CCopasiDataModel::CData::pGUI, CCopasiDataModel::CData::pListOfLayouts, CCopasiDataModel::CData::pModel, popData(), CCopasiDataModel::CData::pPlotDefinitionList, CCopasiDataModel::CData::pReportDefinitionList, CCopasiDataModel::CData::pTaskList, pushData(), CCopasiXML::setDatamodel(), CDataModelRenameHandler::setEnabled(), CCopasiXML::setFunctionList(), and CCopasiXML::setGUI(). Referenced by Arguments::handleCommandLine(), load_cps_model_from_stream(), loadModel(), main(), Arguments::prepareModel(), Copasi2SBMLTranslator::translateFileToSBML(), and Copasi2SBMLTranslator::translateToSBML(). Definition at line 303 of file CCopasiDataModel.cpp. References CDirEntry::baseName(), CopasiML, CDirEntry::dirName(), fatalError, CDirEntry::fileName(), CLocaleString::fromUtf8(), Gepasi, COptions::getValue(), CDirEntry::isRelativePath(), loadModel(), CDirEntry::makePathAbsolute(), mData, CCopasiDataModel::CData::mFileType, CCopasiDataModel::CData::mReferenceDir, CCopasiDataModel::CData::mSaveFileName, CDirEntry::normalize(), CCopasiMessage::RAW, CDirEntry::Separator, and CDirEntry::suffix(). Definition at line 515 of file CCopasiDataModel.cpp. Referenced by CCopasiDataModel(), loadModel(), test000068::test_bug1068(), test000093::test_bug1503_1(), test000093::test_bug1503_2(), test000103::test_bug1743_l2(), and test000103::test_bug1743_l3(). Definition at line 1890 of file CCopasiDataModel.cpp. References CCopasiObject::getCN(), CCopasiRootContainer::getFunctionList(), CCopasiContainer::getObject(), and CCopasiObjectName::getRemainder(). Referenced by CExpression::getNodeObject(), CMathContainer::getObject(), and ObjectFromName(). Definition at line 1940 of file CCopasiDataModel.cpp. Referenced by CSBMLExporter::checkForUnsupportedObjectReferences(), CTimeSeries::compile(), CExperiment::compile(), CModelParameter::compile(), CopasiPlot::compile(), CModelParameterReactionParameter::compile(), COutputHandler::compileRefresh(), contains_necessary_mass_action_elements(), SBMLImporter::doMapping(), CReport::generateObjectsFromName(), COptProblem::getSubtaskType(), CFitProblem::initialize(), COptProblem::initializeSubtaskBeforeOutput(), SBMLImporter::isConstantFlux(), SBMLImporter::isMassActionExpression(), CODEExporter::isModelEntityExpressionODEExporterCompatible(), CSlider::isValid(), CReaction::object2variable(), CReportDefinition::preCompileTable(), SBMLImporter::renameMassActionParameters(), CSBMLExporter::replace_local_parameters(), CSBMLExporter::replaceSpeciesReferences(), CSBMLExporter::restore_local_parameters(), SBMLImporter::setCorrectUsage(), CQExpressionWidget::setExpression(), test000093::test_bug1503_1(), test000093::test_bug1503_2(), test000099::test_bug1675(), test000052::test_bug988(), test000047::test_delay(), test000091::test_delay_in_kinetic_law(), test000091::test_delay_in_kinetic_law_local_parameter(), test000026::test_hasOnlySubstanceUnits(), test000027::test_hasOnlySubstanceUnits(), test000028::test_hasOnlySubstanceUnits(), test000029::test_hasOnlySubstanceUnits(), test000030::test_hasOnlySubstanceUnits(), test000031::test_hasOnlySubstanceUnits(), test000032::test_hasOnlySubstanceUnits(), test000038::test_hasOnlySubstanceUnits(), test000036::test_hasOnlySubstanceUnits(), test000037::test_hasOnlySubstanceUnits(), test000039::test_hasOnlySubstanceUnits(), test000033::test_hasOnlySubstanceUnits(), test000040::test_hasOnlySubstanceUnits(), test000041::test_hasOnlySubstanceUnits(), test000042::test_hasOnlySubstanceUnits(), test000043::test_hasOnlySubstanceUnits(), test000034::test_hasOnlySubstanceUnits(), test000035::test_hasOnlySubstanceUnits(), test000021::test_hasOnlySubstanceUnits(), test000022::test_hasOnlySubstanceUnits(), test000023::test_hasOnlySubstanceUnits(), test000024::test_hasOnlySubstanceUnits(), test000025::test_hasOnlySubstanceUnits(), test000082::test_import_delayAssignment_1(), test000082::test_import_delayAssignment_2(), test000082::test_import_delayAssignment_3(), test000082::test_import_delayAssignment_4(), test000082::test_import_delayAssignment_5(), test000082::test_import_delayAssignment_6(), test000082::test_import_delayAssignment_7(), test000082::test_import_delayAssignment_8(), test000064::test_import_event_assignment_expression_and_hasOnlySubstanceUnits_1(), test000064::test_import_event_assignment_expression_and_hasOnlySubstanceUnits_2(), test000064::test_import_event_assignment_expression_and_hasOnlySubstanceUnits_3(), test000064::test_import_event_assignment_expression_and_hasOnlySubstanceUnits_4(), test000064::test_import_event_assignment_expression_and_hasOnlySubstanceUnits_5(), test000064::test_import_event_assignment_expression_and_hasOnlySubstanceUnits_6(), test000064::test_import_event_assignment_expression_and_hasOnlySubstanceUnits_7(), test000064::test_import_event_assignment_expression_and_hasOnlySubstanceUnits_8(), test000095::test_import_l3_event_1(), test000095::test_import_l3_event_2(), test000095::test_import_l3_event_3(), test000095::test_import_l3_event_4(), test000095::test_import_l3_event_5(), test000087::test_import_reaction_flux_reference_2(), test000064::test_import_rule_expression_and_hasOnlySubstanceUnits_1(), test000064::test_import_rule_expression_and_hasOnlySubstanceUnits_2(), test000064::test_import_rule_expression_and_hasOnlySubstanceUnits_3(), test000064::test_import_rule_expression_and_hasOnlySubstanceUnits_4(), test000064::test_import_rule_expression_and_hasOnlySubstanceUnits_5(), test000064::test_import_rule_expression_and_hasOnlySubstanceUnits_6(), test000064::test_import_rule_expression_and_hasOnlySubstanceUnits_7(), test000064::test_import_rule_expression_and_hasOnlySubstanceUnits_8(), test000075::test_import_time_dependent_function_definition(), test000087::test_simulate_reaction_flux_reference_1(), and CModelParameter::updateModel(). Definition at line 2053 of file CCopasiDataModel.cpp. References mData, mOldData, CCopasiDataModel::CData::mWithGUI, CCopasiDataModel::CData::pGUI, CCopasiDataModel::CData::pListOfLayouts, CCopasiDataModel::CData::pModel, CCopasiDataModel::CData::pPlotDefinitionList, CCopasiDataModel::CData::pReportDefinitionList, and CCopasiDataModel::CData::pTaskList. Referenced by importSBML(), importSBMLFromString(), and loadModel(). Definition at line 2033 of file CCopasiDataModel.cpp. Definition at line 1870 of file CCopasiDataModel.cpp. References C_INVALID_INDEX, CKeyFactory::get(), CCopasiRootContainer::getKeyFactory(), mData, and CCopasiDataModel::CData::pListOfLayouts. Definition at line 1859 of file CCopasiDataModel.cpp. Definition at line 372 of file CCopasiDataModel.cpp. References changed(), CCopasiMessage::clearDeque(), CModel::compileIfNecessary(), CDirEntry::createTmpName(), CCopasiMessage::ERROR, CDirEntry::exist(), CDirEntry::fileName(), CModel::getModelParameterSet(), COptions::getValue(), CDirEntry::isRelativePath(), CDirEntry::isWritable(), CDirEntry::makePathAbsolute(), MCDirEntry, mData, CDirEntry::move(), CCopasiDataModel::CData::mSaveFileName, CDirEntry::normalize(), CCopasiDataModel::CData::pGUI, CCopasiDataModel::CData::pListOfLayouts, CCopasiDataModel::CData::pModel, CCopasiDataModel::CData::pPlotDefinitionList, CCopasiDataModel::CData::pReportDefinitionList, CCopasiDataModel::CData::pTaskList, CModelParameterGroup::refreshFromModel(), CDirEntry::remove(), CCopasiXML::setDatamodel(), CCopasiXML::setGUI(), CCopasiXML::setLayoutList(), CCopasiXML::setModel(), CCopasiXML::setPlotList(), CCopasiXML::setReportList(), and CCopasiXML::setTaskList(). Referenced by autoSave(), main(), Arguments::prepareModel(), and Copasi2SBMLTranslator::translate(). Definition at line 1840 of file CCopasiDataModel.cpp. References CDirEntry::fileName(), CDirEntry::isRelativePath(), CDirEntry::makePathAbsolute(), mData, CCopasiDataModel::CData::mSaveFileName, CCopasiDataModel::CData::mSBMLFileName, and CDirEntry::normalize(). Referenced by SEDMLImporter::importFirstSBMLModel(), and CCopasiXMLParser::SBMLReferenceElement::start(). Definition at line 301 of file CCopasiDataModel.h. Referenced by addDefaultReports(), addDefaultTasks(), addReport(), addTask(), appendDependentTasks(), autoSave(), changed(), commonAfterLoad(), exportMathModel(), exportMathModelToString(), exportSBML(), exportSBMLToString(), getCopasi2SBMLMap(), getCurrentSBMLDocument(), getFileName(), getGUI(), getListOfLayouts(), getModel(), getPlotDefinitionList(), getReferenceDirectory(), getReportDefinitionList(), getSBMLFileName(), getTaskList(), importSBML(), importSBMLFromString(), isChanged(), loadModel(), popData(), pushData(), removeLayout(), saveModel(), setSBMLFileName(), and ~CCopasiDataModel(). Definition at line 312 of file CCopasiDataModel.h. Definition at line 302 of file CCopasiDataModel.h. Referenced by commonAfterLoad(), deleteOldData(), getGUI(), getListOfLayouts(), getModel(), getPlotDefinitionList(), getReportDefinitionList(), getTaskList(), popData(), pushData(), and ~CCopasiDataModel(). Definition at line 303 of file CCopasiDataModel.h. Referenced by CCopasiDataModel(), importSBML(), importSBMLFromString(), and loadModel(). Definition at line 309 of file CCopasiDataModel.h. Referenced by CModel::load(), CReaction::loadOneRole(), and ~CCopasiDataModel().